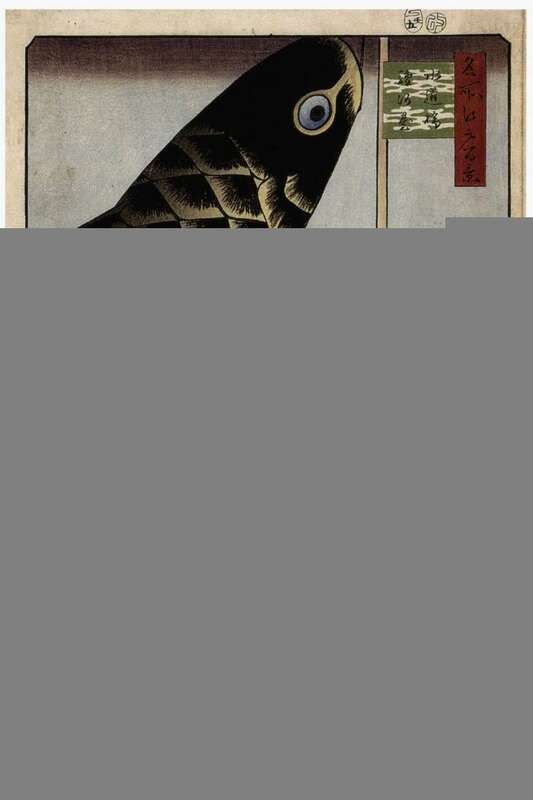 This colour woodblock print is from the series 'One Hundred Famous Views of Edo'. It shows kites in the shape of carp being flown over the samurai district of Surugadai for the Boy's Festival in mid-summer. The leaping carp is a symbol of manly perseverance, and is shown here in exaggerated scale, seeming artificially stuck into the landscape. 'One Hundred Famous Views of Edo' (1856-58) was the final, crowning achievement of Hiroshige's career. Twenty-one of the views included Mount Fuji seen on the distant horizon and three featured the artificial hills constructed as 'mini-Fujis' by members of the Fuji-ko (the Fuji cult). This was a brotherhood that encouraged pilgrimage, rituals and prayers devoted to Fuji, and which by 1825 claimed as many as 70,000 devotees. The mini-Fujis were set in parks and allowed the infirm (or lazy) to engage in a substitute pilgrimage or simply to enjoy them as a kind of theme park.